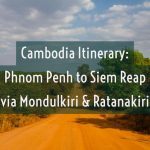 Those of you who follow our Facebook page will have noticed that we’re currently in Cambodia, a country that lures us back on a regular basis. Although it’s two years since we were last here, I’ve lost count of the number of times we’ve been to Phnom Penh and it’s a city that grows on us a little more each time we visit. Our usual routine, once the sun starts to set, is a stroll along the riverfront followed by a few beers in one of the nearby restaurants and then dinner. But one night we tried something a little different and signed up for a ‘Vespa Nightlife Experience’. 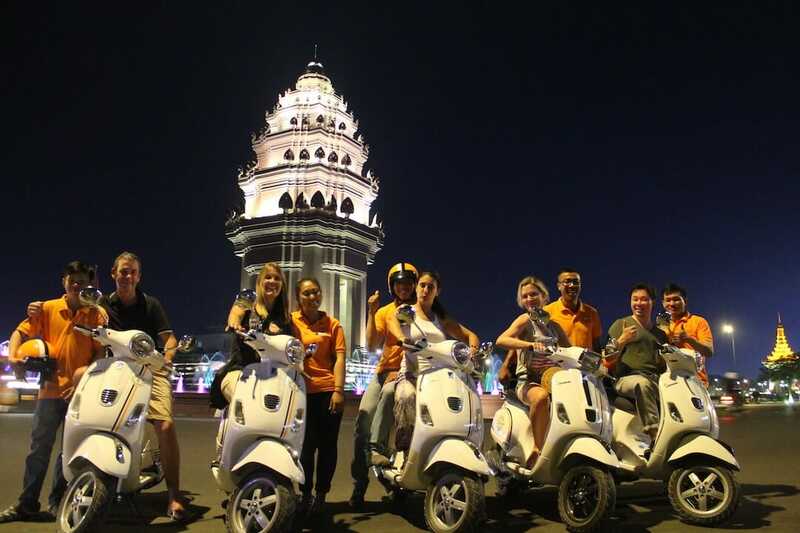 We didn’t need much persuasion: having taken two scooter trips with Vespa Adventures in Ho Chi Minh a couple of years ago, we jumped at the chance to experience their Phnom Penh after-dark tour. 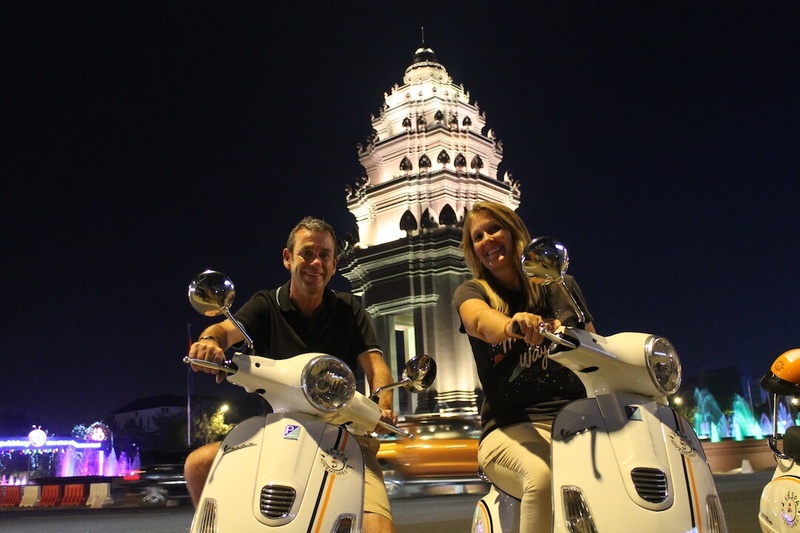 And so, instead of looking at the traffic from a stationary rattan chair, we were zipping through it on the back of a cool looking Vespa, taking in some of the city’s iconic spots, stopping to sample cold beer in local joints, and fancy cocktails in posh bars. Our drivers picked us up promptly from our guesthouse – looking down to the street from our balcony we spotted their signature orange shirts and helmets. Seated comfortably on the back of our shiny white Vespa scooters our drivers began navigating expertly through the Phnom Penh traffic to take us to the meeting point and first stop of the evening. Our guide for the evening, Monorith (Rith for short), was waiting for us outside the FCC (short for Foreign Correspondents Club). We were the first to arrive and chatted a bit whilst we waited for ‘more friends’ to arrive as Rith charmingly put it. As Phnom Penh veterans, the FCC isn’t new to us (in fact we’d just had lunch there the previous day! ), but I don’t believe there is a better place for a sundowner in the city. The colonial style FCC has history and it has a view. Oh, it also does great cocktails! We ordered our favoured tipple and set about introducing ourselves. As well as us two Brits, our fellow riders were from Spain, Hong Kong and the Netherlands. After an aperitif and appetisers at the FCC, it was time to hit the road. Our small group bonded quickly and it looked like Rith’s main challenge of the evening would be breaking up the developing party when it was time to move on from each venue! 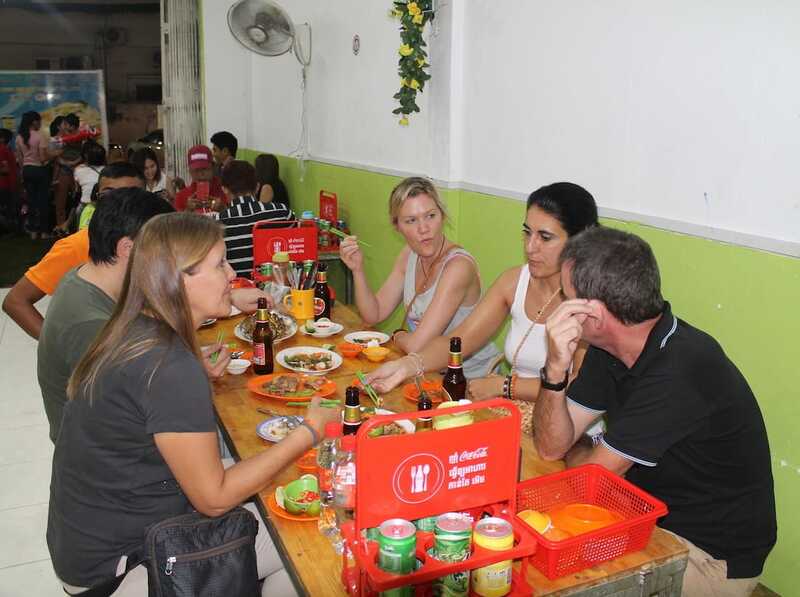 In the time between arriving at the FCC and leaving, the sun had set and residents of Phnom Penh had spilled out onto the city streets to enjoy the cool evening air, either with a stroll along the riverfront, or a picnic in front of the Royal Palace. At this time of the day Phnom Penh’s traffic is at its busiest and is at its highest level of craziness to make for an exhilarating ride through the energetic streets. *OK, the ants really were the only weird thing we saw! 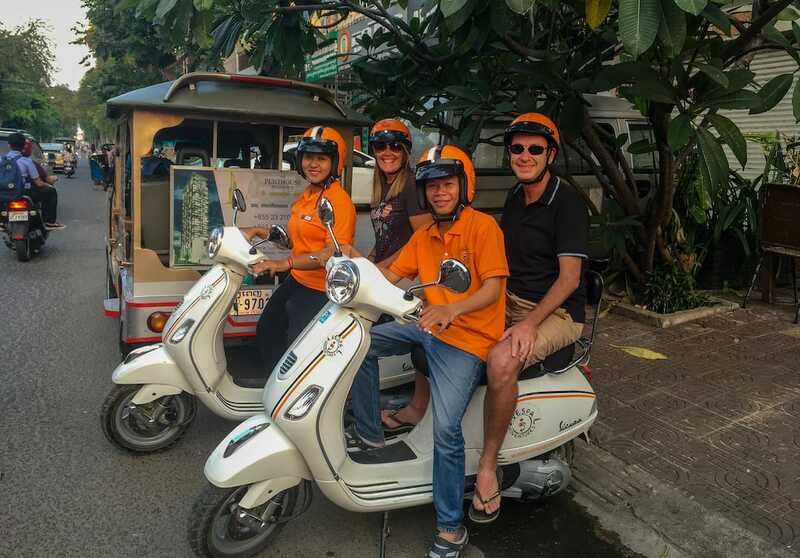 Emerging from the opposite side of the market, our smiling drivers were lined up, next to “our” Vespa, helmet in hand in a pattern that would be repeated after every stop throughout the evening. Once again, we zipped off through the night traffic to our next venue. After the tourist and expat environment of the FCC, it was time to experience somewhere a little more local. 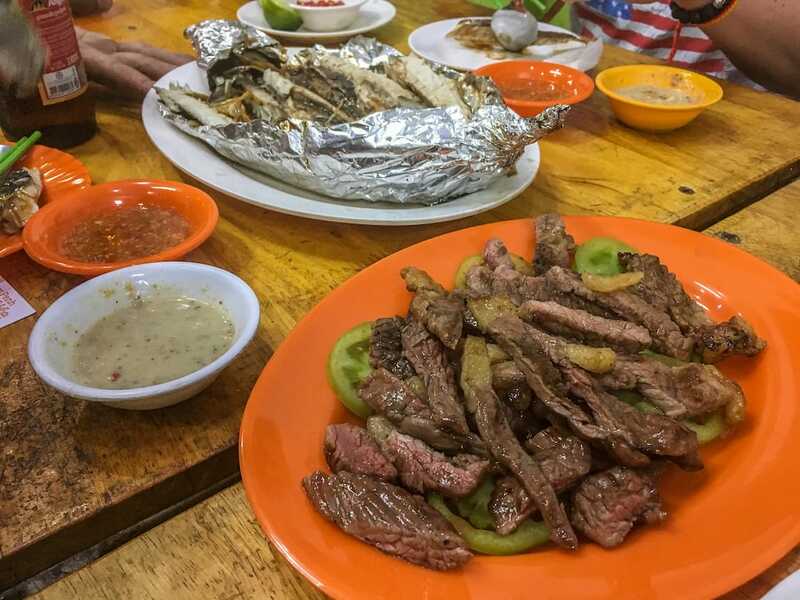 The crowded restaurant was clearly popular with Khmers and as we took our seats, Rith handed out the beer and food started appearing in front of us… freshly cooked fish, and grilled beef and squid cooked with Cambodia’s signature Kampot pepper. At this point, it became clear that we were not going to go hungry (or thirsty) on this tour! Time flies when you’re having fun and even at this early point in the evening, the chat was flowing. 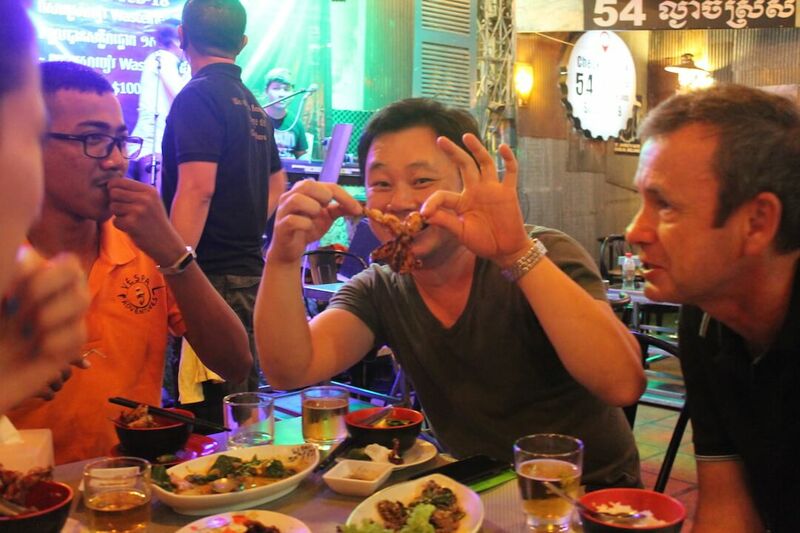 Coupled with the restaurant’s lively atmosphere, Rith had to assert his authority (in the strongest possible way a Khmer does i.e. not much!) to encourage us to move on. Our next stop was the foot of Wat Phnom, the city’s most famous (and only?) hilltop pagoda and the place which gave Cambodia’s capital its name. As travellers, Mark and I are pretty lazy when it comes to nightfall. 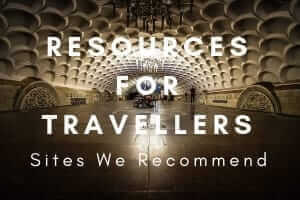 Come 6 pm, we’ve often walked 15-plus kilometres around a city and don’t have the energy for much more than a cold beer or a glass of wine and a quick bite to eat. As a result, I have to admit that we don’t always see as much of a city or town at night as maybe we should. 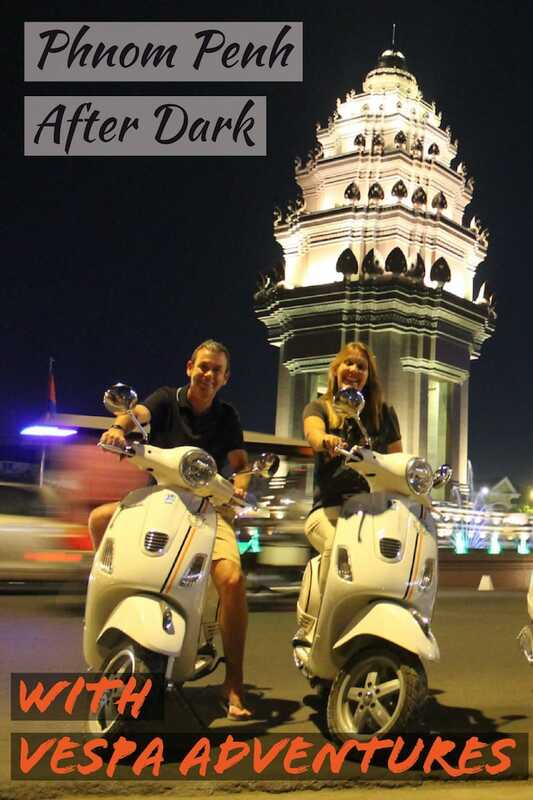 So one of the things that I really enjoyed about this particular Vespa adventure was seeing some of Phnom Penh’s iconic sites lit up at night. I’ve visited and wandered past Wat Phnom on several occasions but had never really seen it at night when it’s at its prettiest. After a rundown on the significance of the temple and a group photo, it was back on the bikes to cover the short distance to our next venue. On the subject of photography… We didn’t take our ‘big camera’ on the excursion for two reasons. One: we didn’t want to have an unwieldy DSLR hanging around our necks (OK it would have been Mark’s neck) whilst on the bikes as it’s both uncomfortable and an unnecessary risk. Bag (or camera) snatching is something to be conscious of rather than paranoid about but it does happen in Phnom Penh. Particularly if you’re a naive tourist holding a camera out all but asks for it to be grabbed from your hands. Two: and probably far more relevant is the fact that we’re totally useless at nighttime photography! So we rode with iPhones only, as did everyone else in our group. As we were sipping our cocktails at the FCC, one of the Vespa Adventures crew started snapping away with his DSLR and ‘Rith took down our email addresses so that photos from the evening would be sent to us. At that moment I was especially glad that we had decided to leave our camera at home. 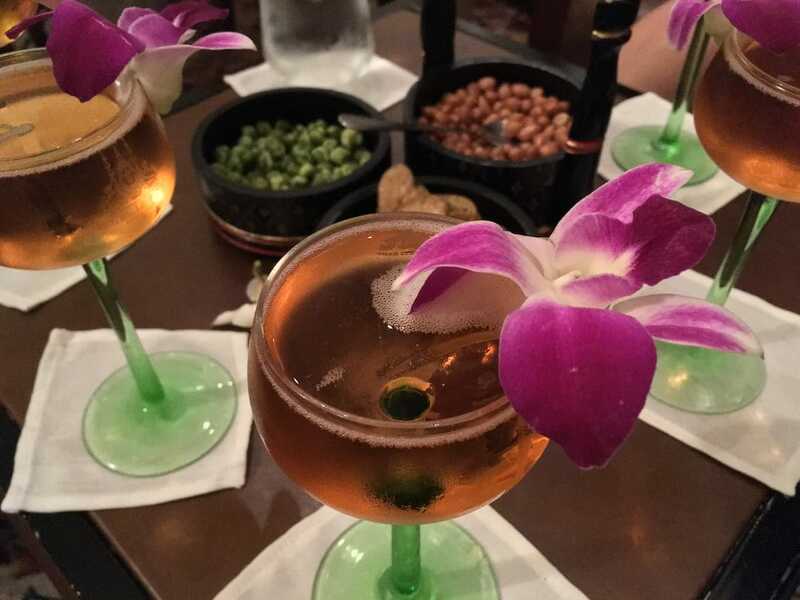 The historic Raffles Hotel Le Royal was about as much as a contrast as you can get from our previous venue but that’s another thing I enjoyed about the tour – the continuous contrast between the bars and restaurants that we visited. None of us felt particularly suitably dressed for a cocktail in one of Phnom Penh’s best-known bars in one of its swankiest hotels but somehow no-one felt uncomfortable either. Our posh cocktails and nibbles were awaiting us and as we lapped up the sophisticated surroundings, Rith told us about the Champagne and Cognac cocktail we were drinking – the bar’s signature Femme Fatale cocktail which was invented for Jacqueline Kennedy when she was a hotel guest in 1967. In a glass cabinet, is apparently the very glass she drank her cocktail from (they invented a cocktail for her and she only drank one? How rude! ), complete with lipstick on the rim. We joked that someone at the hotel probably had the job of applying fresh lipstick to the glass every now and again to keep this piece of history intact! Before we left Raffles, Rith suggested we all avail ourselves of the 5-star facilities as we were off to another local spot. Posh toilets are always nice but it’s not like we went anywhere on the tour that was so basic I wouldn’t use the bathroom there! From the comfy sofas and refined, subdued atmosphere of Raffles, our next stop was in another vibrant and bustling restaurant, and we found ourselves once again seated around a low table on those child-sized plastic chairs you get all over Asia, More beer and more food… This time it was time to get a bit more adventurous with our dining choices and among the dishes on offer were barbecued frog and another dish which looked familiar from our earlier market visit… beef with red ants! In case you are a vegetarian and reading this, I did ask about that and was assured veggies would be well-catered for. It’s just that we were all meat-eaters (and anteaters!) in our group. Whilst I was glad of the opportunity to try weirder types of food like frog and ant, I was relieved there weren’t any spiders or other bugs on the menu. I’ve been travelling in South East Asia long enough not to have to put on a brave face whilst nibbling on a tarantula leg! Everyone was game when it came to trying both frog (which of course tastes like chicken!) 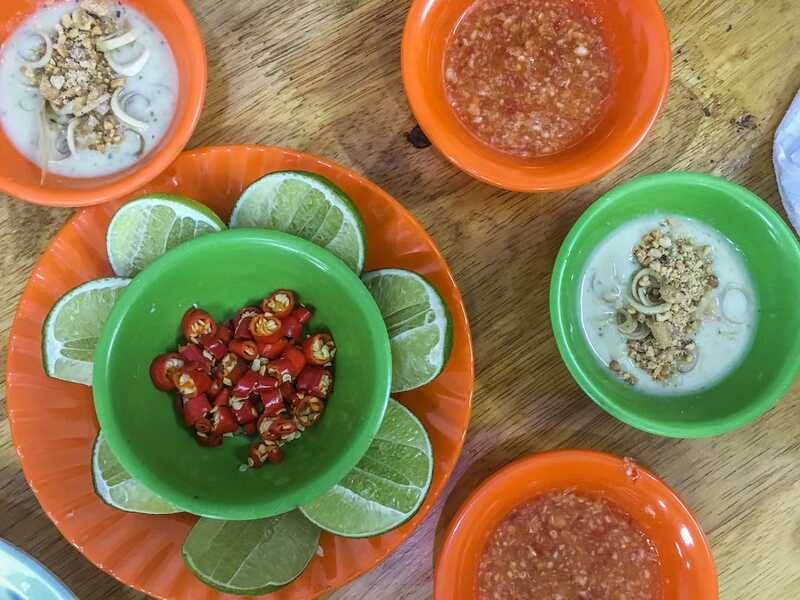 and the ants which didn’t have a flavour that was distinct from the beef and other herbs and spices they were cooked in. 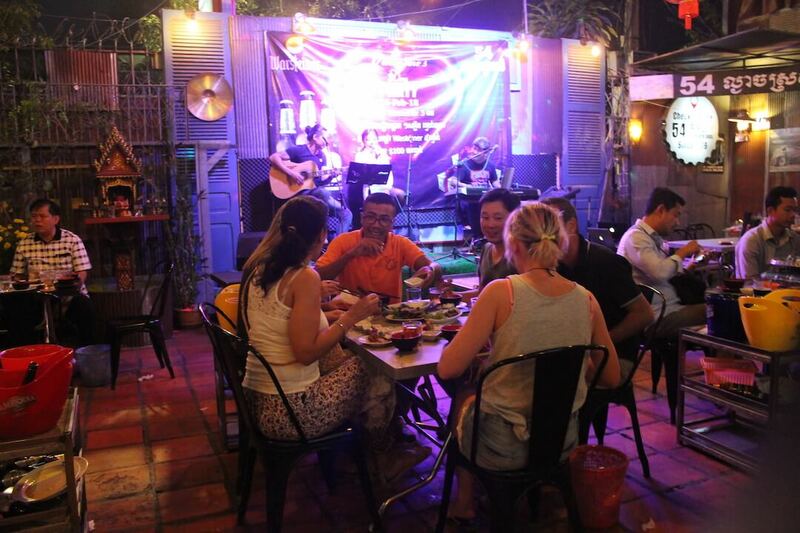 The ambience got even livelier when the band started up – a Khmer group playing Latin beats! All too soon it was time to leave and again, we all wanted to stay longer because we were having fun but at the same time we were itching to hop back on the back of our Vespas for more cruising through the streets. Our final cultural stop was Independence Monument, a Vann Molyvann classic (an influential Cambodian architect whose work features in Mark’s post: Phnom Penh’s Distinctive Architecture). 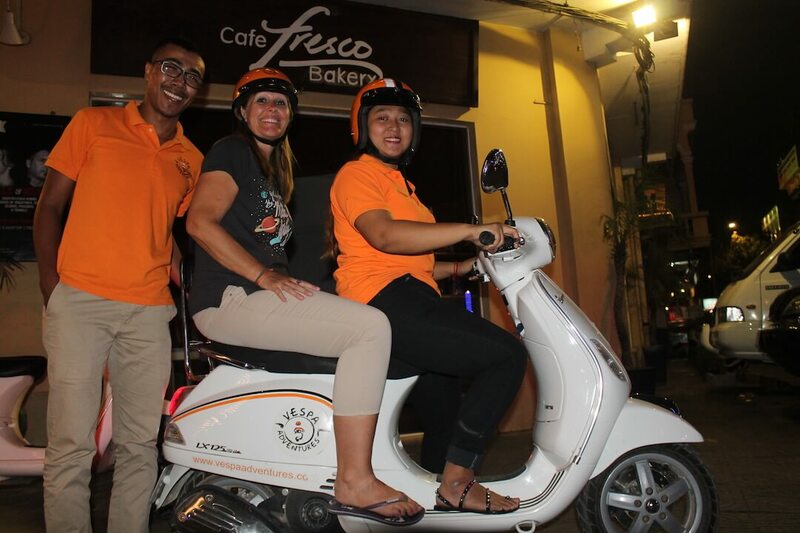 Rith told us a little more of the city’s history before we all lined up with our Vespas and drivers for the final photo opportunity of the night. It’s a cool spot and again one I hadn’t really appreciated by night before. 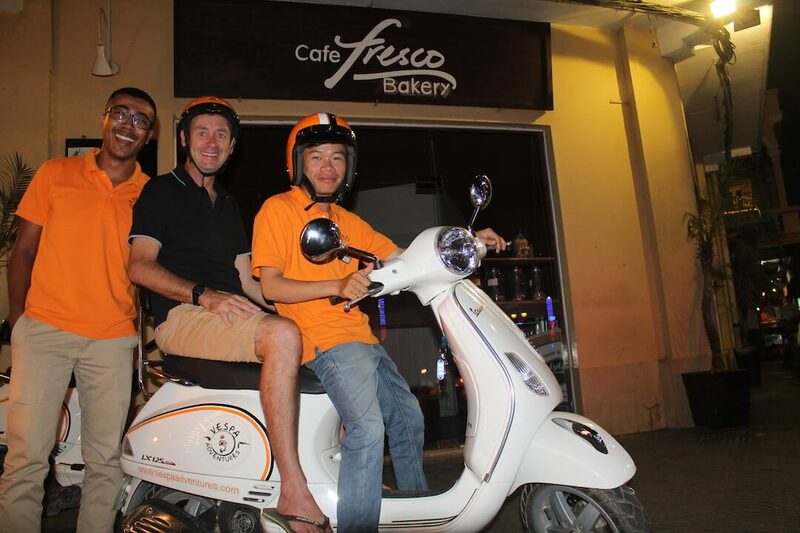 Back on the Vespas, we scootered a short distance before Rith led us, on foot, down a dark back alley… Just as we were all wondering where we were heading, we emerged in a funky little area of bars, cafes and boutiques. I knew we weren’t far from the Independence Monument so how come I didn’t know about this hidden gem? It wasn’t until the end of the evening when we left the bar from a different side that I realised I did know exactly where we were! 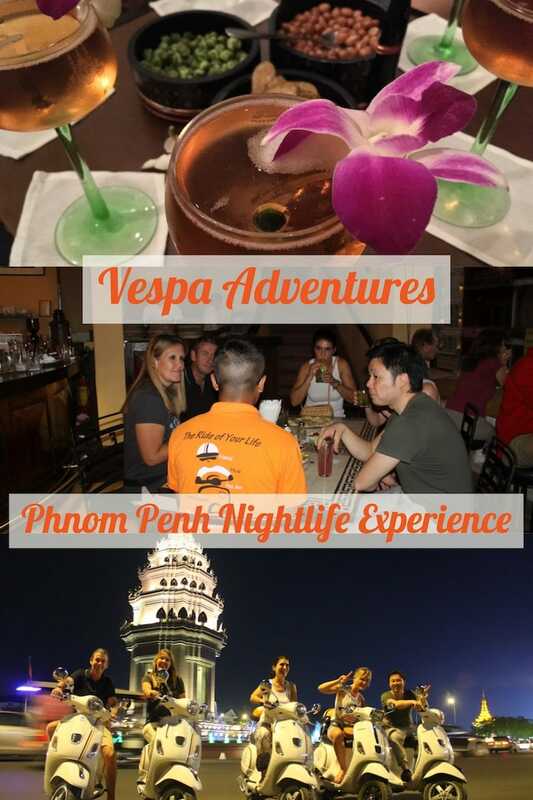 It’s fair to say that at US$75, the Phnom Penh Nightlife Experience isn’t the cheapest tour around but I actually think for what you get, it represents pretty good value for money. Plus, although you could arguably recreate the tour for less, you can’t replicate the cool factor of zipping through the streets on the back of a Vespa! 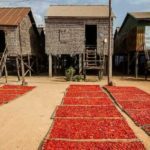 Even though we’ve spent far more time in Phnom Penh than the average tourist, the tour still managed to show me parts of the city I hadn’t seen before, or parts of the city in a different light. 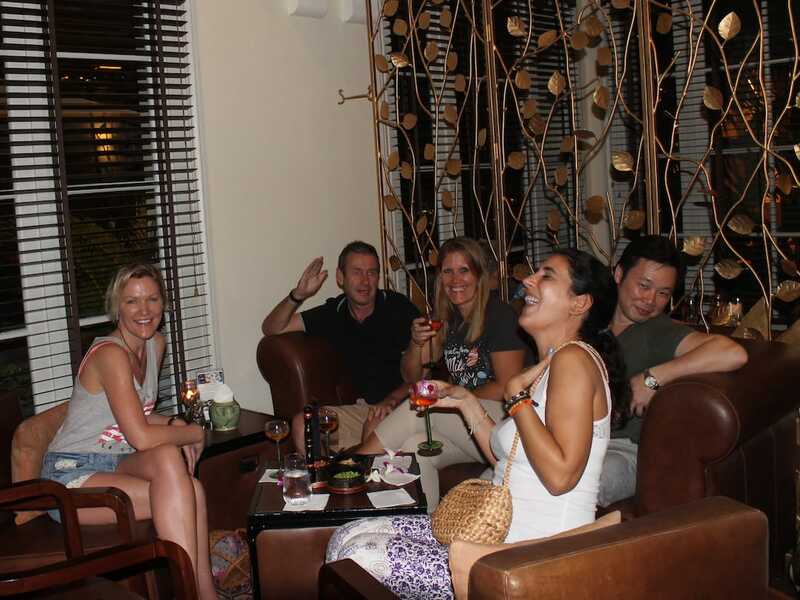 I especially liked the mix of local places and more upscale ones and our group particularly loved the hidden bar area that we ended our evening in. 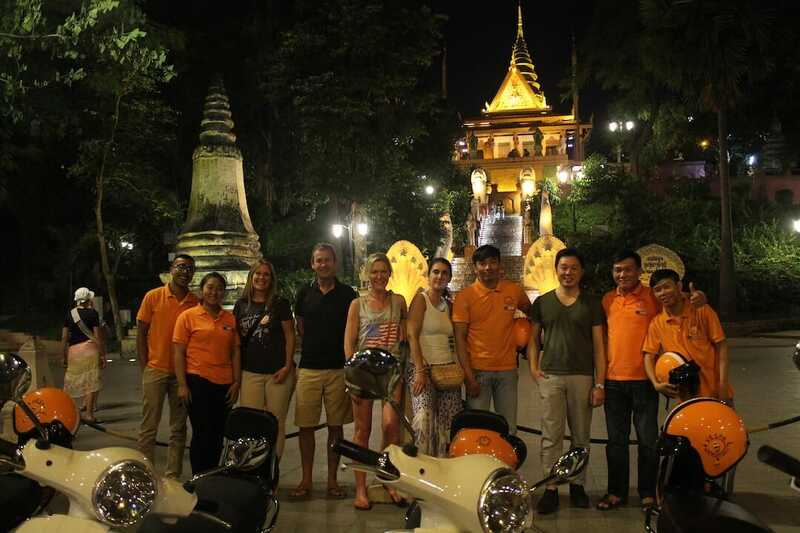 Thank you Vespa Adventures Cambodia for a great night out! We are also grateful that the team captured some great photos of us that are so much better than some of our blurry iPhone snaps! This post contains a mix of the two and you can probably work out which are which!